During the past five decades, various types of chemistries have been used for conjugation of molecules such as antibodies, peptides, proteins or other reactive ligands to the surface of liposomes. In general, the conjugation can be achieved through the N-terminus, the C-terminus or the available sulfur (e.g. Fab’ fraction or thiolated antibodies). Not all chemistries have the same yield and efficiency of conjugation and often reproducing biocompatible batches can be a challenge. Coupling of sulfhydryl groups with maleimide groups has been the most widely used conjugation of antibodies to liposomes. Different lipids which are offered for thioether conjugation contain maleimide, aromatic maleimides such as N-[4-(p-maleimidophenyl)-butyryl] (MPB) or 4-(N-maleimidomethyl)cyclohexane-1-carboxylate (MCC) group. The maleimide function group of MCC which contains an aliphatic cyclohexane ring is more stable toward hydrolysis in aqueous reaction environments rather than the aromatic phenyl group of MPB. MPB and MCC lipids are non-PEGylated lipids and they have separate kits and protocols than PEGylated maleimide lipids. One of the major problems of using maleimide chemistry for conjugation is the rapid hydrolysis of maleimide lipid. The rate of hydrolysis is much faster in alkaline pH and therefore, controlling the pH throughout the entire process is necessary and it is recommended to use the pH of 7. Due to the hydrolysis of maleimide group, our kits are designed for post-insertion of ligand conjugated maleimide lipid into the preformed liposomes. 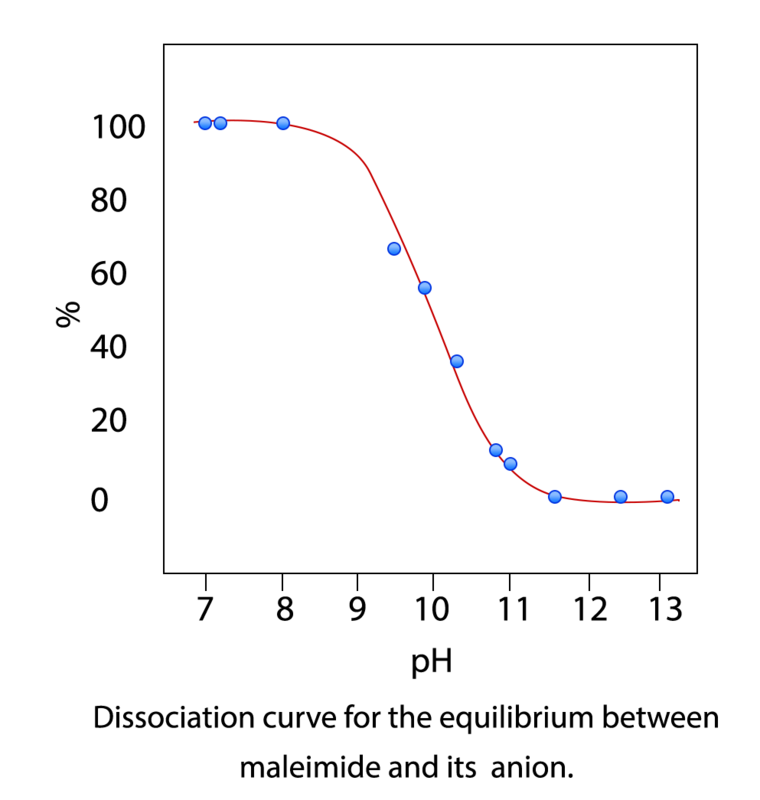 After post conjugation, the liposomes must be used right away because hydrolysis may occur after sulfhydryl coupling to the maleimide as well. Another problem is the reactivity and oxygen sensitivity of sulfhydryl group on thiolated antibody or Fab’ fragment. Due to that the conjugation reaction should be done under argon or nitrogen using inflatable polyethylene glove bag chambers. Thiolation, which is adapted to the modification of all the antibody functional groups, is relatively clean, fast, and efficient. However, different antibodies may be more sensitive to some procedures than others. Therefore, it is recommended to select the chemistry and site of modification depending on what procedures are compatible with the antibody. Conjugation reaction between maleimide-activated DSPE-PEG lipid with the sulfhydryl group of the ligand. The micelles formed from lipid conjugated ligand and non-reactive PEG lipids are mixed together and the PEGylated lipids are post-inserted into the liposomes in order to form PEGylated ligand surface conjugated liposomes. Immunosome®-Maleimide is a PEGylated product. For the other sulfhydryl reactive (PEGylated and non-PEGyalated products) and also Immunosome® products suitable for other types conjugation methods see here. A Sonicator. It is better to have a bath sonicator. If you do not, that is fine, and you still can follow the protocol. You may also use a vortex instead of the sonicator for agitation of the solution as well. For the 2-ml kit, add 100 µl of PBS buffer to the dried lipid film. For the 5-ml kit, the amount of the added buffer is 250 µl. It is preferred to sonicate the hydrated lipid film using a bath sonicator and sonicate the micelle solution for 5 minutes. If you do not have a bath sonicator then hydrate the dried lipid film with PBS for at least 1 hour and constantly rotate the solution in the round bottom flask using a rotavap (not connected to vacuum) or by hand to make sure that all the dried lipid on the wall of the round bottom flask will go to the solution and form micelles. Alternatively, you can use a vortex to agitate the solution. The goal is to have all the dried lipid on the wall of the round bottom glass to go to the micelle solution. Cover the mouth of the round bottom flask with parafilm. Refrigerate the micelle solution of non-reactive PEG lipids until it is ready to be mixed with micelles formed in the step 5. The 2-ml kit contains 1.30 mg (0.22 µmol) of reactive DSPE-PEG(2000)-Maleimide lipid (vial 2). The 5-ml kit contains 3.25 mg (0.55 µmol) of reactive DSPE-PEG(2000)-Maleimide lipid (vial 2). For the 5-ml kit size, the content of vial 2 (DSPE-PEG(2000)-Maleimide lipid) should be dissolved in 250 µl of chloroform or methylene chloride. Transfer the solution to a 10 ml round bottom flask. Dry the chloroform using a rotary evaporator or under a stream of nitrogen to make a dried lipid film. Dried DSPE-PEG-Maleimide film is hydrated with PBS buffer to form a micellar lipid solution. If you are using the 2-ml post-insertion kit, then hydrate the 1.30 mg of dried DSPE-PEG-Maleimide lipid film in 100 µl of buffer, and if you are using the 5-ml post-insertion kit, then hydrate the 3.25 mg of dried DSPE-PEG-Maleimide lipid film in 250 ml of buffer. Incubate the micellar lipid solution with the antibody, protein or peptide at 3:1 molar ratio or lipid to protein. Allow the reaction to proceed in phosphate buffer under the nitrogen (inert gas) chamber for 8 hours at room temperature with moderate stirring. The concentration of antibody, peptide or protein that is added to micellar solution is depend on the solubility of your molecule. It is recommended to use a fairly concentrated solution. For example, use a volume around 100 µl of antibody, peptide or protein for 2-ml kit and around 250 µl of antibody, peptide or protein for 5-ml kit. Remove non-conjugated antibody, protein, peptide or ligand by dialysis. We prefer dialysis to size exclusion columns. Dialysis is a much slower process but there will be minimum loss of immunoliposomes after the prep is cleaned from non-conjugated protein/peptide/ligand. Spin columns are much faster but you can easily lose over 50% of the liposomes on the spin column. We recommend using Float-A-Lyzer® dialysis cassette from Spectrum Labs. You need to choose a cassette with proper MWCO depending on the MW of your protein, ligand, antibody or antibody fragment. In this case, we recommend using a dialysis cassette with MWCO of 300,000 dalton. NOTE: If you decide to use a dialysis cassette, you need to make sure that the MWCO is below 1,000,000 dalton. At 1,000,000 dalton, the pore size on the dialysis membrane gets close to 100 nm and therefore your liposomes can be dialyzed out. You cannot use dialysis cassettes and spin columns blindly. They come in various sizes, and you need to choose the correct size wisely. Dialyze the immunoliposome solution in 1 liter of PBS at pH 7 for 8 hours. Change the dialysis buffer with a fresh 1 liter of PBS and let is dialyze for another 8 hours. After this step, your cleaned up immunoliposome is ready to be used. 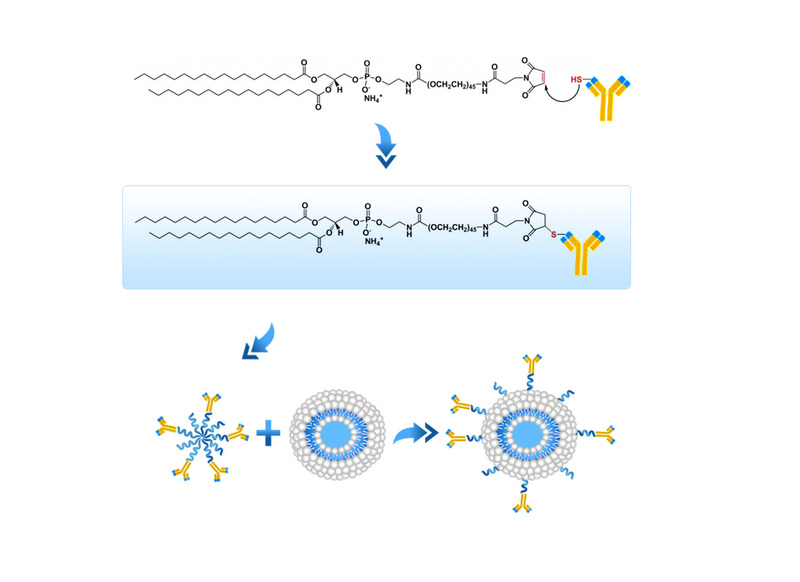 After conjugation reactions, liposomes containing excess maleimide or thiol groups may exhibit undesirable qualities, such as aggregation, reactions in vitro and in vivo, and immunogenicity. These reactive moieties can be quenched with reagents containing iodo-, maleimide, or sulfhydryl groups where appropriate. This is likely to be a particularly serious problem for thiolated liposomes. Therefore, it is recommended that the antibody be thiolated to generate the appropriate reactive entities for the final conjugation reaction. Immunosome®-Maleimide (PEGylated) post-insertion kit comes in three vials: vial 1 is a white translucent liquid made of nano size unilamellar liposomes which does not contain any reactive of non-reactive PEGylated lipid. Usually due to the small size of liposomes no settling will occur in the bottom of the vial. Vial 2 contains reactive DSPE-PEG(2000)-Maleimide lipid in white powder form. Vial 3 contains non-reactive DSPE-PEG(2000) lipid in white powder form. Immunosome®-Maleimide kit is made on daily basis. The batch that is shipped is manufactured on the same day. It is advised to use the products within 4 months of the manufacturing date.